Baltimore students came together on December 8, 2014 to write about the police killings of Michael Brown, Eric Garner, and Tamir Rice. On May 3, 2015, these same students came together to write about the police killing of Freddie Gray in Baltimore. On November 16, 2016, students came together to write about the election results. 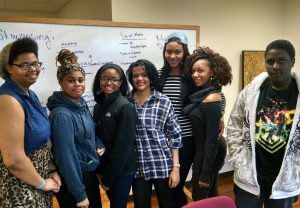 The first student write-in produced the writing on BlackWordsMatter.org. We’ll continue to collect and share writing about race and police brutality. Thanks to a grant from the Maryland Humanities Council, Black Words Matter has been able to ..